As you may have noticed, I have snazzed up my blog a bit. It was getting stale and crusty and so I checked the Sell By date and it was pretty bad. Luckily I was able to scrape off the mold and put it in a pretty container for safekeeping for many months to come. Doing this blog has done a lot of great things for me. I’ve learned a lot about cooking, I have something to look forward to every day, I lost 22 pounds thanks to Weight Watchers, and now I am getting freebies! Somewhere on the mainland a FedEx box containing new cookbook by Harumi Kurihara is flying over to me. I’m very very excited about it and can’t wait to try out recipes and give a review on it. I didn’t recognize her name at first but then when I went to Amazon to look it up I recognized her book immediately. I never bought that book though, mostly because they seemed more like dishes you cook for company. This one is on Home Cooking so I’m hoping it will have a lot of bento potential! Last night we had teri hamburgers, which we usually eat with rice but since I was feeling in a good girl mood I decided to try it out with my salad with no rice. It was surprisingly very good. It tasted just like eating a hamburger with no bun, which I’d always though would be lame, but it wasn’t. So continuing my good girl streak I’ve made a hamburger salad. The patty looked rather depressing though, so I added a face made out of cheese and nori. I wasn’t sure what kind of face to make so I just went with a silly face. Baby Girl saw his jaggedy mouth and announced that I was having a football bento and I guess from her angle it does look like a football. I added some grated carrot for added color and some edamame for variety. I’m going to stretch a bit and call this all Core because of the trivial amounts of things in the patty that would count for points. I mean I don’t think I need to count a few bread crumbs and the lil bit of sugar. 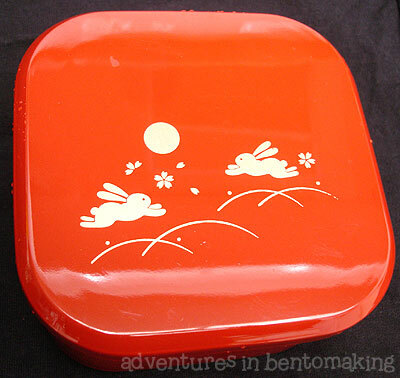 The box I’m using is a black lacquer box with gold bunnies on the cover. I haven’t had time to put this up on the store yet, but I do have two black and two red boxes like this available for $2.99 if anyone is interested. Also, be sure to check out the boxes section as I added in some of the Hello Kitty stuff that I’d run out of before. The orders I’m backed up on should go out tomorrow as I have to take the day off to pick up the kids. My in-laws are going out of town and so we’ll have to cook or buy food for ourselves starting tomorrow. I think it’ll be a great time to try out new dishes!